Designed for the most sensitive scalps, this hypoallergenic shampoo with aloe vera* gently cleanses your hair and immediately provides much awaited comfort. Enriched with witch hazel, allantoin and marine spring water, it works to hydrate, relax and soothe the scalp. After 3 weeks of use, 91% of the volunteers who tried the product found that feelings of irritation were soothed and the scalp regained lasting comfort**. 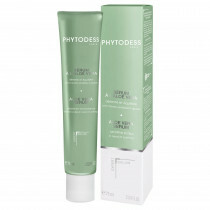 Soft cleansing base free of sulfate surfactants : gently cleanses the hair and scalp. Apply to wet hair, lather, then rinse. For complementary action, apply the PHYTODESS aloe vera Serum to the scalp.